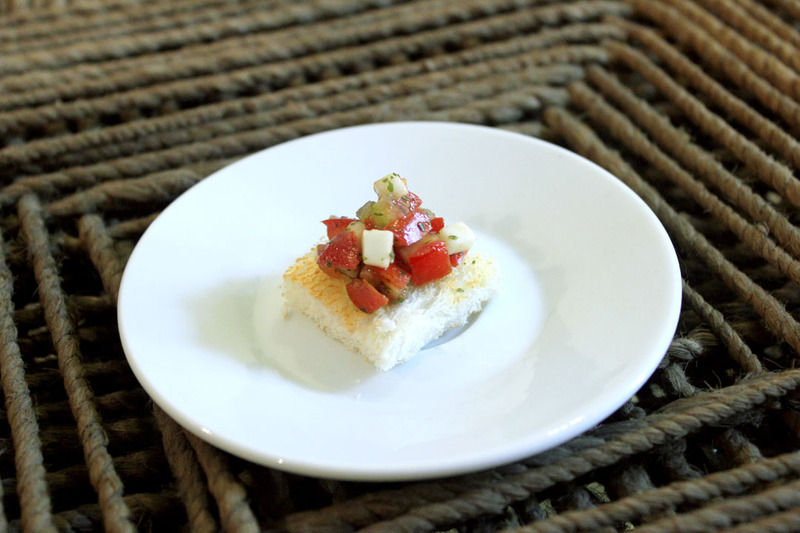 This bruschetta-ish snack doesn’t really deserve a recipe considering it’s so ridiculously easy to make. Since the sauce verte is somewhat reminiscent of a pesto I thought it would go well with plain chopped tomatoes. I really didn’t want to got through all the trouble of picking up a baguette for a simple snack like this and used sliced bread; it might be worth the effort at a party though I think it works really nicely as is. Mix the tomatoes, sauce and cheese together. Keep aside to chill for about 10-15 minutes. When you’re ready to serve lightly toast the bread. Trim the edges and cut each slice into 4. Top each piece with the mixture, making sure you get a couple of cubes of cheese on each slice. This looks divine. The perfect appetiser.